Once iOS 12 is available, you may be eager to update your iPhone to iOS 12, but frustrated by the fact that iPhone have not enough storage? Don't worry, to release more space for iOS device, we have picked some simple tips, with which you are surly to get enough storage to upgrade to iOS 12. What's more, with more free iOS space, you can completely enjoy the attractive new features of iOS 12. The reality is that there are so many apps in your iPhone that you may never use. Allowing them remain on your device will take up a whole lot of storage space on your device and this affects your device in the long run. Therefore, check for those apps on your device you never use and uninstall them.You can go to Settings > General > Storage & iCloud usage > Manage Storage and just tap “Delete App” to get them off your device. The iMyFone Umate Pro or iMyFone Umate Pro for Mac is the world’s leader when it comes to clearing iPhone device for junks. In fact, it is regarded as one of the best iPhone space saving and privacy protection tool. You can freely clear up your cache, crash logs, cookies and any other junk files on your device with just one click. It is important to note that things like caches files take a lot of space on your storage capacity if left untouched and that is why the Umate Pro is needed to clear them up. This will ensure that you free up space on your iPhone/iPad and ensure your device performs better and optimally. The other thing you need to heed is that when you update, deleted things such as the deleted iOS 12 cache can be synchronized from other iOS devices and iCloud automatically by the default setting. You’d better check the settings to prevent this from happening. It’s suggested to restart your iPhone after upgrade, and you can keep all your personal settings by restarting with apps on in background. 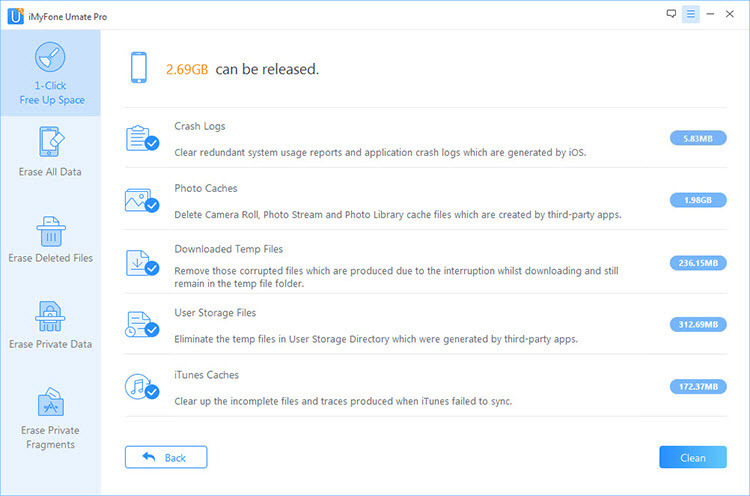 To release iPhone storage, it’s advisable to store important files in some storage service servers rather than keeping them all in your iPhone. 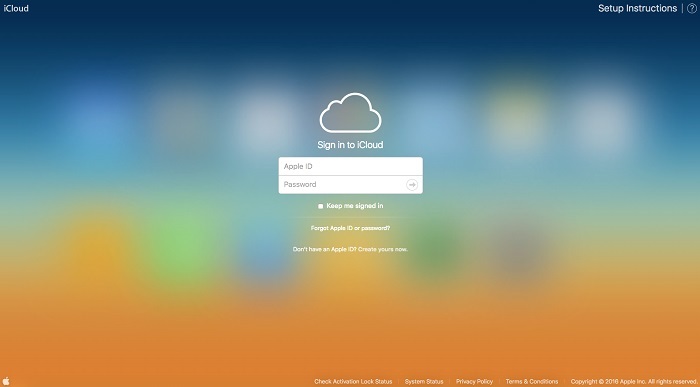 Considering the safety of your iPhone, Apple will kindly suggest you to upload your data to iCloud. However, 5GB free storage seems too insufficient to save all the backups. You can also use other storage service like Dropbox and Google Drive to store big files of photos, music, and videos. 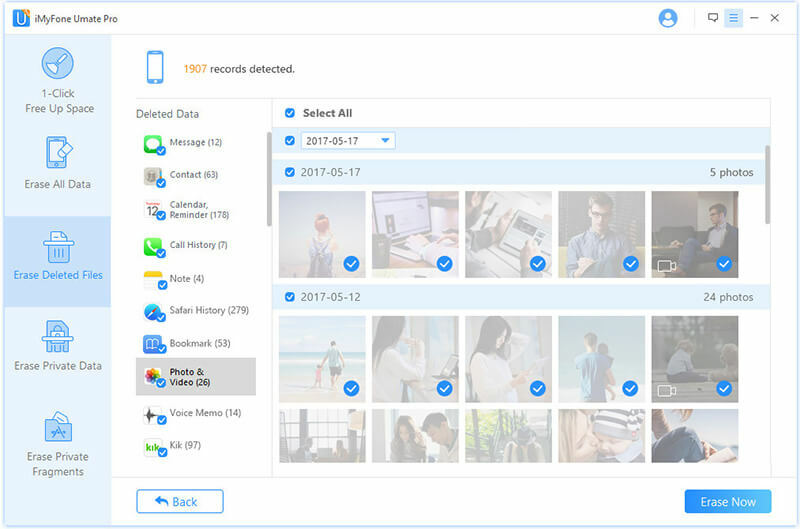 Using iMyFone Umate Pro to permanently erase Some iPhone data is one of the best ways to free up more storage and ensure adequate privacy protection. 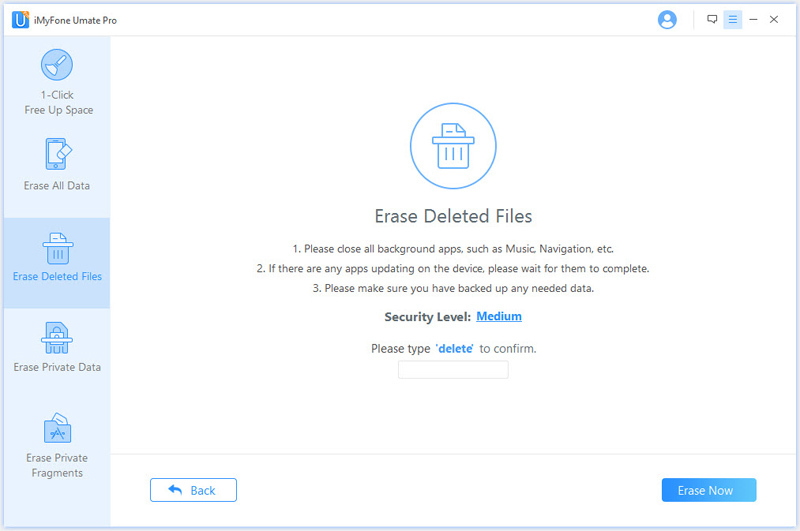 Erase Previously Deleted Data: The Umate Pro will scan your device to find these previously deleted data and erase them permanently in such a way that they cannot be recovered even with the most modern data recovery tools. 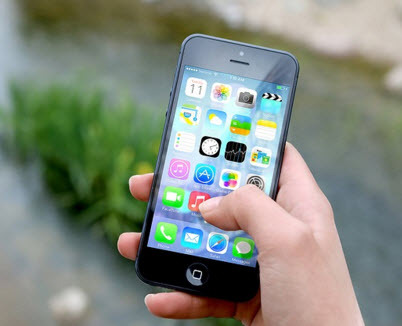 Erase Private iPhone Data: Umate Pro can erase your private and sensitive iPhone data and ensure that they are secure even in cases where you have to sell or donate the device because they cannot be recovered with any data recovery software. Erase Whatsapp Messages and Attached Videos/Photos: Not only messages but also attached WhatsApp files,they will all be erased by Umate Pro.Whether the photo or video is attached to an message, document etc, Umate Pro is capable of erasing them. If you have already deleted your iPhone data like messages, contacts, photos, videos, notes, call histories etc by using the normal delete option, it is important to understand that it is not enough! The deleted data can be recovered easily. You need to permanently erase them to ensure it is 100% unrecoverable. Run the program on your computer, it will show the following interface prompting you to connect your iPhone with it. Please connect with an original cable. After you connect your iPhone with iMyFone Umate on your computer, you will see its home interface. Choose the erase mode that you want, then click on “Scan” button to analyze your iPhone. Step 3. Free up space for your iPhone by clicking "Erase Now" button. After the whole cleaning process finish, you are surely to have more free storage space on your iPhone. iMyFone Umate iPhone storage cleaner supports cleaning on various Apple devices, including iPhone, iPad, iPod. Free download and try it to get more space for your iPhone running iOS 12. Junk File Clean-up: With over 25 analysis technology, the program can find out all hidden junk files, including app caches, cookies, crash logs etc. Just very shortly, they will be removed for FREE easily. Clear Temporary File: Armed with unique cleaning technique, iMyFone Umate can clear all the invisible temporary files like downloaded temp files, user storage files and corrupted files. Manage Photos: For this function, you'll have 2 options to choose: iPhone photo compression & photo deletion. Photo compression can reclaim 75% of your photos' space, while mass deletion allow you to delete multiple photos in one click. All original photos will be automatically Backed up on your PC before compression and deletion. Delete Large Files: Umate will scan your iOS 12 device and find all the large files. Comparing with deleting large files directly, another advantage of iMyFone Umate is that it will back up the selected files to your computer before deletion. Remove Unused Apps: All the apps will be listed according to the space they take up. Needn't to delete apps one by one, you can remove multiple apps by one click on the "Remove" button under the app list. Permanently Erase Sensitive Data: Erase not only current personal files but also sensitive files deleted in the pass, and the erased data cannot be recovery by any data recovery software. 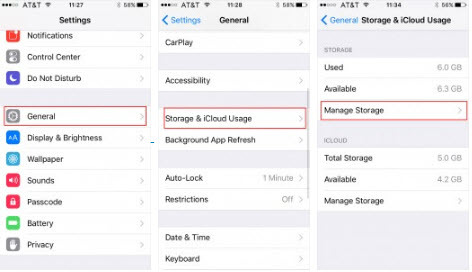 iphone storage issues confused almost every iPhone user, we do should know more about it.